Torrential rapids, plunging mud holes and soaring hurdles: in the outdoor competitions at the Olympic Games, athletes pushed themselves to the limit. But it's hard to depict this in pictures alone. This is why researchers at the Fraunhofer Institute for Integrated Circuits IIS created an intelligent camera that instantly delivers additional metadata, such as acceleration, temperature or heart rate. The new INCA can be seen at the IBC trade show in Amsterdam from September 7 - 11 (Hall 8, Booth B80). Just a few more meters to the finish line. The mountain biker jumps over the last hill and takes the final curve, with the rest of the competition close at his heels. At such moments, you do not want to just watch, you would really love to put yourself in the same shoes as the athlete. How does he push the pace on the final stretch? How fast is his pulse racing? What does he feel like? Viewers will soon be able to obtain this information in real time, directly with the images. Because the INCA intelligent camera, engineered by Fraunhofer researchers in Erlangen, makes completely new fields of application and perspectives possible. INCA not only renders images in HD broadcasting quality, it is also equipped with a diversity of sensors that provide data on GPS position, acceleration, temperature and air pressure. In addition, the camera can be seamlessly connected to external systems via Bluetooth or WLAN: for instance, a chest harness to track heart rate, or face recognition software that can open up completely new perspectives. This way, viewers may be able to catch even a small glimpse into the emotional life of the athletes. In addition, the camera can also be combined with object recognition and voice detection systems. 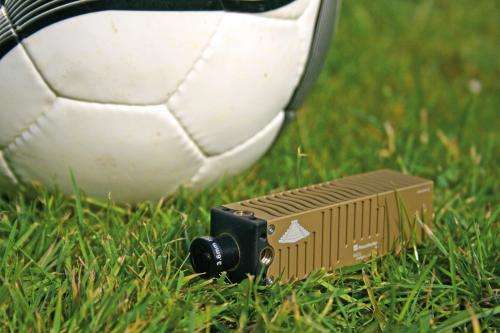 Despite its tiny size (2x2x8 cm), the miniature camera is powerful enough to handle professional film and TV productions, thanks to its high performance capacity and minimal power consumption. It is best suited to extreme situations, because INCA resists sand and dust, withstands cold and debris, and can be readily installed as a helmet camera. In addition to athletic and event broadcasts, other potential areas of application include animal movies and nature shows, as well as expeditions and adventures, where such additional data can provide invaluable information. The camera analyzes data and by doing so, enables the user to experience and record more about his or her environment while filming. Since the camera system is based on the Android operating system, by playing an app, it can be easily and flexibly adapted to the requirements of the respective subject matter. INCA possesses enough computer power to execute complex algorithms as well. As a result, it can correct objective errors and compress HD videos in real time. During its development, these issues posed major challenges to the scientists, as group manager Wolfgang Thieme of Fraunhofer IIS explains: "The core issue was figuring out how to house such a massive range of functionality within the tightest space. The OMAP processor (Open Multimedia Applications Platform) makes all of this possible. As the heart of the camera, this is comparable to a CPU that you find in any ordinary PC. The difference is that additional function blocks for various tasks have been integrated into the OMAP. Without these blocks, the system would neither record HD video images nor process and issue them in real time. The most difficult task was programming these blocks and using them for data processing."